The Hermit is a tarot card that represents solitude and pursuits done by oneself. The Knight of Wands, however, represents a bold, rash, or brave move that has been thrust upon you, rather than one you take yourself. This combination of cards might indicate that your current romantic relationship will be coming to an end and it’s not going to be your choice – You will be informed by your significant other that there’s some issue that cannot be resolved, and thus you must strike out on your own, not by your choice. 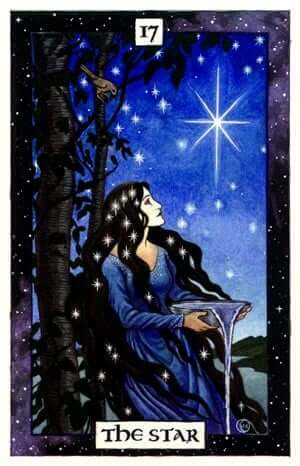 The Star is a card that represents tranquility, going with the flow, and the path of least resistance. The Two of Cups is a card that represents a romantic attraction between two strangers, among other things. Used in a future-position, this pair of cards might represent a short fling, or a romantic relationship that will start and end abruptly, or even a one-night stand. On the other hand, it could also mean that a sudden relationship will spring up and you will not know that you are in it until it’s already there. You’ll have drifted in the flow into a relationship and it will blossom around you. Among its many meanings, the Page of Wands is considered a “messenger” card – if it shows up in your reading, expect a piece of news or specific ultimatum or input from somewhere else. The ten of Wands represents burdens, extra work, or oppression. This combination is an indication of a warning that something is going to get very heavy in the future for you. You will have a chance to avoid it because it’s an ultimatum, but it’s a very specific warning – do this thing, or be punished.